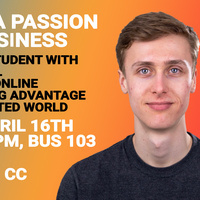 Learn how a young entrepreneur with limited capital turned an idea into a business by developing a business model, generating a revenue stream, and taking advantage of our connected world. Meet Stetson Doggett, the founder of an online business that helps visitors find the best phone plan for them at the most affordable price. Individuals who would like to request accessibility accommodations should contact icyeo@ithaca.edu. We ask that requests be made as soon as possible to ensure they can be met.